Vivien Orlando, formerly employed as a barista by Starbeams and as an organizer by Kloset Kompany, has decided to take her skills at organizing on the road as the Organization Oracle, professional organizer for those who need their attics, their wine cellars, or their offices organized. The first step in her business plan is the purchase of a tiny house, the smallest one designed by Bale’s Tiny Dreams of Cobb, Kentucky. Vivien drives from her parents’ home in Jacksonville, Florida, to Cobb to pick up Shrimpfork (so named because at sixty-four square feet, it is the opposite of Southfork, the ranch of Dallas fame). Once she hitches Shrimpfork to her hand-me-down-from-Dad orange truck, she sets off for Sandstone, New Mexico, and her first client. Seventy-year-old Priscilla Workman, a germ-phobic agoraphobic, needs someone to organize her “attic,” actually a very large, long room packed with “trunks, bags, boxes, and clothes racks” and stacked furniture. Priscilla, a former hippie who still jams with Janis Joplin records and her boxer-mix Clay, proves to be anything but the standard variety sweet, little, old lady that she appears to be at first meeting, and her attic proves to be a treasure trove. But it takes Vivien time to locate the treasure Priscilla is seeking, a one-eyed doll named Hilda that was once Priscilla’s constant companion. Priscilla is determined to take the doll to be evaluated on This Old Thing, an antiques appraisal show that Priscilla and her neighbor, twenty-five-year-old Marco Marquez, the grocer’s son, watch religiously. When the episode of This Old Thing scheduled in Taos is canceled, both Vivien and Marco accompany Priscilla to San Diego for the episode filming there. Vivien and Marco, who have been mutually suspicious of each other’s interest in Priscilla, develop an intense interest in each other, but the real romance proves to be Priscilla’s as a piece of her past becomes satisfyingly present. I had mixed reactions to Tiny House on the Road. Celia Bonaduce is a field producer on HGTV’s House Hunters and has worked on other shows, including HGTV’s Tiny House Hunters and ABC’s Extreme Makeover: Home Edition. Her mother is a tiny house owner. Bonaduce’s experience shows in the details she includes of Vivien’s adjustments to living in Shrimpfork and in her descriptions of Priscilla’s home. These details are a strength of the book. The characterization is more uneven. I loved Priscilla with her long family history, her idiosyncrasies and vulnerabilities, and her unexpected love story, and the young people’s reaction to her colorful past made me laugh. But Vivien became less interesting to me once she arrived in Sandstone, and the relationship between her and Marco seemed shallow and too predictable. Despite imperfections, the novel was an entertaining read. 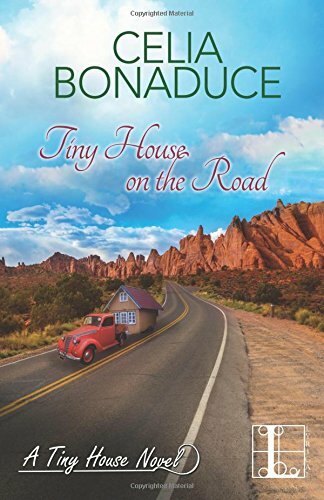 The second in Bonaduce’s Tiny House series, it can easily be read as a standalone. If you are looking for something that is a bit different with a touch of romance from two generations—a pair of baby boomers and a pair of millennials—you may enjoy this book. I no longer watch all the do over shows, but I love the idea of looking into a treasure filled attic. Thanks for this review.